The Oki MC780 is designed for small to medium offices needing a user-friendly multifunction device that can easily integrate into their workflow to simplify and improve productivity. It guarantees efficient handling of documents through fast processing speeds and time-saving features that won't compromise environmental performance, but it is expensive with limitations that could be challenging for the growing workgroup. A sleek design makes the Oki MC780 easy to set up and operate. It is powered by a 1.3GHz processor and runs on 2GB of RAM with a 160GB hard disk drive, so it can print in speeds of up to 40ppm. The MC780 weighs approximately 60Kg and measures 811mm tall, 604mm deep, and 522mm wide, so it needs more installation space. Paper is handled by a 530-sheet standard feeder, 100-sheet multi-purpose tray, and a 100-sheet RADF. The operator panel has a 23cm colour backlit touch-screen LCD with a keypad, one-touch operational buttons, and six LEDs. The device connects via Ethernet and high-speed USB 2.0. It prints, faxes, scans, and copies. There are built-in stapling and sorting finishing options in the Oki MC780. Security is easily configurable through the large operator panel with a colour display. The Oki MC780 comes with the smart Extendable Platform (sXP), an architecture that lets users integrate the machine into their existing software and network systems. Timesaving features include a reversing automatic document feeder and a network-friendly interface. For eco-friendly operation, users may opt for toner-save mode and high capacity cartridges. Up to 30 users can share the device. The scan and copy resolution of the Oki MC780 is limited to 600x600dpi. The fax does not support telephony features, PC fax, and colour fax. 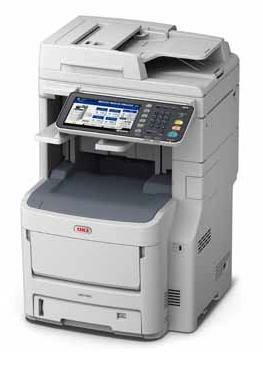 Users need to upgrade the Oki MC780 for additional paper capacity and finishing options.